This Vultee BT-13B was manufactured in Downey, CA in 1944 and was owned and flown by Bob and Flo Irwin, founders of Aircraft Spruce, from 1951 to 1962. It went through numerous owners over the next 53 years before it was acquired by Jim and Nanci Irwin in 2015 and restored to near original condition. Born in 1919 in Kansas City, Bob Irwin earned a doctorate in chemical engineering at the University of Missouri, served as a Link trainer instructor in the Army Air Corps in World War II, and moved west to Southern California in 1950. Bob had earned his private pilot license in an Aeronca Champ in 1948, and in June 1951 he purchased a war surplus Vultee BT-13B for $700 at Long Beach Airport, joined the Civil Air Patrol, and flew extensively around California. Flo Irwin, born in 1919 in Rochester, NY, became a legal assistant and executive secretary and moved to Southern California in 1951. Bob and Flo were introduced by friends in early 1953, and Bob immediately asked Flo if she would like to go flying with him in his airplane. She agreed, and they were soon flying every weekend, taking picnic lunches to their destinations. Bob and Flo married in October 1953 and flew in the BT-13 to La Paz, Mexico for their honeymoon at a time when all the airstrips in Baja California were short and rough, and when fuel was poured through a chamois from a 55 gallon drum. They continued to fly every weekend and spent time at Fullerton airport and Brackett Field working on the airplane and polishing the bare aluminum skin. Their first son Jim was born in November 1954 followed by John in 1958, and when the boys were small everyone would fly in the BT-13. Bob and Flo had started Fullerton Air Parts in 1955 and were supplying aircraft parts to customers throughout Southern California. By 1962, the boys were too big to have everyone travel in the BT-13, so Bob reluctantly sold it and purchased a Navion project. When the buyer flew the BT-13 away from Corona Airport in March 1962, he was convinced that it would soon be scrapped and the engine used in a crop duster in Texas. Bob and Flo sold Fullerton Air Parts in 1965 but later that same year Flo established Aircraft Spruce in Fullerton, selling only aircraft grade spruce wood. Bob restored a 1947 Ryan Navion and the family traveled in it through the 1960’s until Bob sold it and acquired a 1968 Navion Rangemaster in 1976, which he flew until he retired after 50 years as a pilot in 2000. The Navion is still owned by the Irwin family today. After Jim and Nanci Irwin took over management of Aircraft Spruce in 1980, Bob and Flo moved to Lake Havasu City, AZ in 1983 and founded ACS Products Co, which John and Frances Irwin operate today. 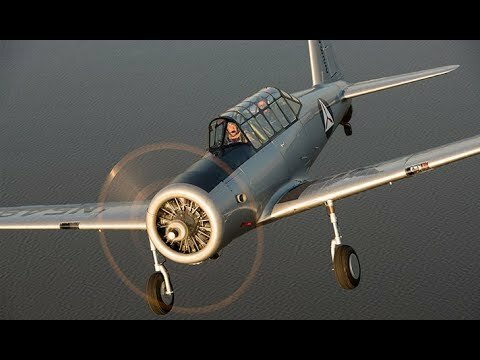 In early 2013, John Irwin was checking the internet for any sign of the Irwin’s BT-13, N54822, and came across a link to N13VV. John sent the link to Jim, asking if this could be their dad’s BT-13, which everyone assumed was scrapped 50 years earlier. Jim checked the registration which led him to Hal Ewing, an Aircraft Spruce customer who had owned N13VV for 20 years. Hal confirmed that N13VV used to be N54822, and sent Jim the entire civilian ownership records showing himself as the current owner and dating back to 1951 when Bob Irwin was the first civilian owner. Hal was an airline pilot who flew the BT-13 to airshows, and had experienced an engine failure in 1996, deadsticking the aircraft into a short private airstrip. After the aircraft was trailered back to South Carolina, it sat until 2015 when Jim purchased the BT-13 and had it trucked to Chino Airport in Southern California. The registration is now once again N54822 and the aircraft has been fully restored by Aero Trader. Bob Irwin passed away at age 95 in June 2015, but earlier that year he was thrilled to know that the Irwin family had acquired his beloved BT-13 and was bringing it home to Southern California, where he had spent so many hours in the air with Flo 60 years ago. N54822 flew for the first time in 22 years on May 23, 2018 at Chino Airport. After restoring the aircraft to its original condition the Irwin family had it flown to AirVenture in Oshkosh in July 2018 and then donated it to Planes of Fame Museum in Chino, CA.